Set against a backdrop of survival, Michael Bloom’s Thinking Like a Therapist provides readers with a different approach to the typical case study. The author follows a young couple through an immense tragedy and subsequent strife, inviting the reader on a journey through isolation and its effects on the couple’s relationship. In a unique conceptualization of a case study, the author juxtaposes scenes of the couple fighting for their lives with scenes of the couple in therapy sessions, as though they can magic themselves from the wilderness to the therapist’s office. Each chapter has three sections: journal entries narrating part of the couple’s adventures, a dialogue between the couple and the therapist, and a discussion of the therapist’s goals and interventions in the preceding therapy session. The book offers a new approach to discussing mental health therapy in a more entertaining fashion than typical counseling books. What Bloom does exceptionally well is illuminate the inner workings of a therapist’s mind. He offers readers well-articulated insights into the mind of a highly competent therapist, which is an excellent learning tool for those studying the art of counseling. The therapist acts with intentionality, and Bloom clearly demonstrates the process of translating thought into action. Novice counselors will learn the importance of intentionality as well as the importance of implementing structure into counseling. Readers unfamiliar with the counseling field will be introduced to what counseling looks like and how the process of change manifests itself outside sessions. Even though the events surrounding the young couple are extreme in nature, what surfaces during their excursion is highly relatable to anyone who has been in an intimate relationship. Among the many issues the couple work through are joint decision making, depression, differentiation, boundaries, jealousy, and sexual intimacy. 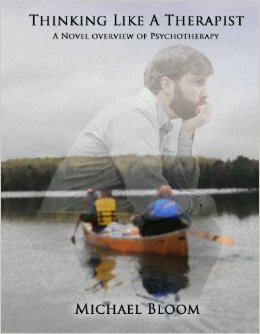 Bloom describes the couple’s struggles and successes with the eye of a behavioral expert. Ultimately, all readers will find the implications of Bloom’s book realistic and applicable. Reviewed by: Joseph M. Graham, Jr., doctoral student in counselor education, University of Central Florida, Orlando, FL. Bloom, M. (2013). Thinking like a therapist: A novel overview of psychotherapy. Sioux Falls, SD: Cogitavi.